Mookie Betts capped a 13-pitch, fourth-inning at-bat against Toronto starter J.A. 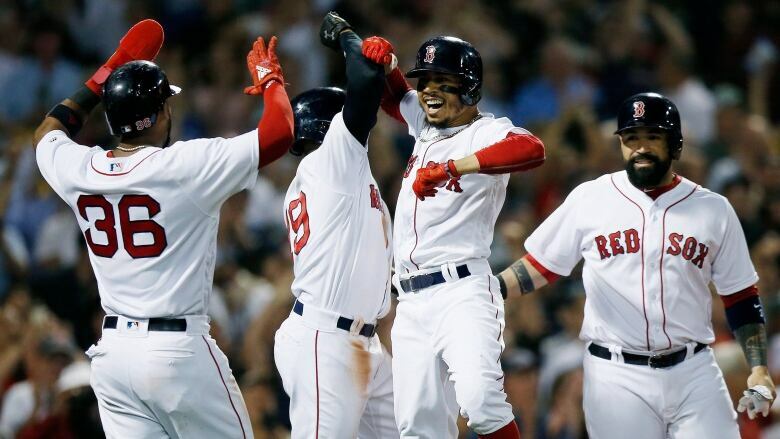 Happ with a go-ahead grand slam to power the host Boston Red Sox past the Blue Jays 6-4 to open a four-game series Thursday night at Fenway Park. ​Mookie Betts was so excited he nearly tripped when his feet got tangled on the way to first base. After Hernandez's two-run homer soared deep into the centre-field seats, Price didn't allow another run until Morales led off the seventh with another shot to centre that pulled the Blue Jays to 5-3. Smoak hit an RBI double on a drive to centre in the eighth, when a fan in the front row interfered with the ball and Randal Grichuk scored to pull the Blue Jays to 6-4. Cora said Price deserved the recognition for recovering the way he did after the first inning. Cora said Price's performance in the fifth after the long rally by Boston's offence was a key to the Red Sox winning.